One of our favourite pastimes in China was people watching, and there is no better place to do it than the myriad tea houses, like this one in Chongqing. And this elderly couple, also in Shanghai, were practicing their daily Tai Chi in the park, with the ubiquitous card players in the background! Me too, but it seemed too slow and less demanding than even Yoga, from what I saw! I could be wrong. These pictures definitely took me back to China. It’s the everyday scenes that made the biggest impressions. With us too 🙂 The community interaction in public places was fascinating to watch! Our activities 😛 Great shot ! I might fit in rather well in Chinese every day life. I go to t’ai chi classes twice a week and I love noodles. Perfect photos for everyday life. I love the outdoor spaces in China, filled with people doing really rather enchanting things. Beautiful pictures as usual, Madhu. Absolutely wonderful…I love people watching. Thank you! Look forward to seeing yours Eliz. 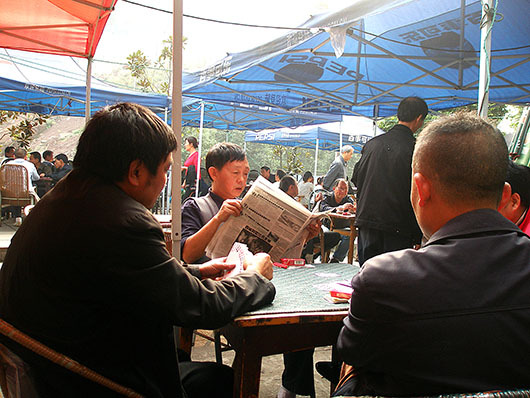 The card players are a universal phenomenon. Aren’t they? But haven’t seen quite so many on every street corner as in Shanghai! Great choice for everyday life! Great shots, I wish I had the patience to learn Tai Chi. Me too. I have been delinquent with my yoga as well in the past few weeks 😦 Thanks Jennifer. Thank you Jo 🙂 And delighted that Jackie is improving! And I agree, but don’t you think we see less of this in urban India these days? thanks for sharing these lovely images from china …. the beauty of the everyday! I love that they practise their exercise in the park. Yes and this is a common sight in all the parks if you get there early morning or late evening! perfect expression of everyday life. thank you for a morning in China. Thanks Shaantz. Would love to learn Tai Chi. People watching is one of my favorite pastimes as well. Your photos from Chongqing, China do show this a wonderful every day activity. delighted you think so Judy 🙂 Thank you! Yes Arindam, but there seems to be a lot less poverty on the surface at least. Mahjong! 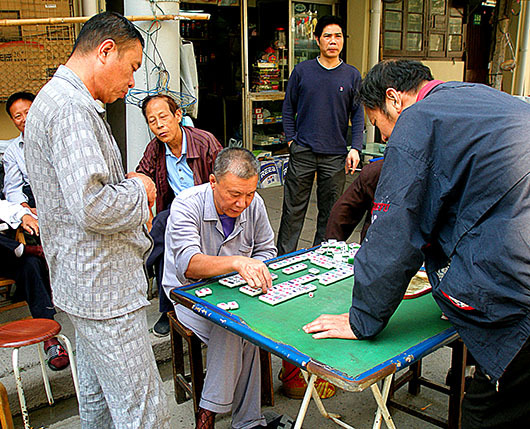 Do you know how to play mahjong? That is the game the men are playing. That is quite popular at home. I am amazed at how people can tell what a tile is by its texture. 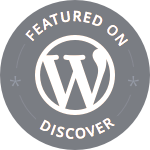 I have captioned the images to show up when you hover above them. Just realised you cant hover on an Ipad or smart phone! Shall have to revert to regular captions. great mood here. would love to travel to China one day….. thanks for sharing! Oh yeah, my share is about Indonesian traditional cloth Batik. Hope you have a time to read it. Your entry was beautiful Albadr. Thank you for dropping by. I’ll be trying some Tai Chi and Yoga in the future, but need to heal more before I attempt it. My acupuncturist has talked to me about tai chi being one of the reasons for longer life in China. Thanks Fergie. There must be some truth to that. I think it is the mental focus required of both Yoga and Tai Chi that aids in holistic healing. The sense of peace and calm, even in the busier shots, looks so inviting! Wonderful photos of daily life! 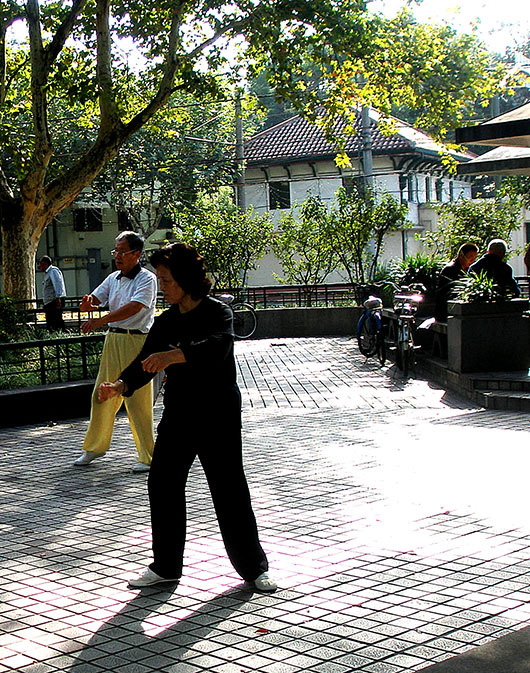 Love the tai chi in the park….lovely! Great images for the challenge!